Hiroshi Tanahashi won the IWGP Heavyweight Championship for the eighth time this past Friday at Wrestle Kingdom. 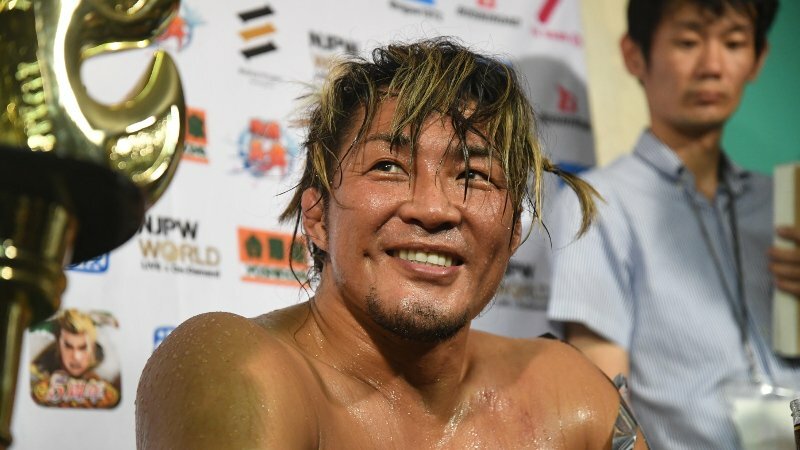 It is I, the 67th IWGP heavyweight champion, Hiroshi Tanahashi. When I won the IWGP belt for the first time in 4 years, it was something fresh. I said in the post-match comments that it was like I had won it for the first time. The IWGP title had felt out of reach. Maybe that was the case. Today it is the 1st time for this new Tanahashi to take a picture of the belt. I’m not at the point where I can say I want to do this and that with the title. Not yet. First of all, I have decided the challenge. Even if I end up defeating Jay, there are still many challenges ahead. I am determined to at least hold this title until the Tokyo Dome shows in 2020 at least. This is my firm goal. Either that or I will take this belt and exceed my past defense records and exceed Okada’s streak. A lot of visitors saw me at the Tokyo Dome, and on the NJPW World. Thank you very much for watching me (*He bows*) That’s it from me. The fact that Okada (Kazuchika) has been defeated at the dome must be acknowledged, so I will admit that ability, but there’s no need to worry, I’ve got this! I lost in Nagaoka, I won in the dome, my record against Kenny in singles matches is 1 win and 1 loss. I’m ready for a rematch anytime, but is Kenny going to work with New Japan Pro-Wrestling in the future? I don’t really know for sure…. But I get the feeling that our paths will cross again in the future. Since, our opponents make a very powerful tag team, having seen the state of the Tanahashi / Okada team, we have to really step up our game. Heh Heh Heh … (smiles bitterly) … No, I’m not fed up with it … Um… … Can I this say honestly? Uh, at the time I won, a member staff said “You only have so many minutes to make post-match comments” Don’t you get it?! That means I cannot do the special effect that I often do! (*Makes an electric guitar sound effect*) You know what I mean (*does it again, but louder*). So, if I play air guitar more than twice I will lose the impact of the last one! It’s like being stuck between a rock and a hard place (more bitter smiling). I also really wanted to play air guitar for the fans. But I was in rough shape. Also, the staff said, “Mr. Tanahashi, we do not have time!” This is not really something the fans need to know, but that’s what happened. But from now on, no matter what, I’m going to summon my last ounce of strength to fulfill the fans dreams.